Gone are the days when washing your decks, house sidings, patio furniture or car would take a couple of hours. Today, with the invention of electric pressure washers, such cleanups get done really fast. In a matter of minutes, these electric or gas pressure washers will bring to an end a job that would have otherwise required several gallons, washing brushes, a lot of soap and more fuel. Apart from being a cheaper alternative, electric pressure washers are lightweight, easy to manoeuvre, and above all, very efficient at cleaning almost everything. 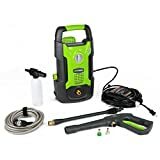 Engineered with 5-Quickly Interchangeable Spay Nozzles, this pressure washer is one of the best you can find in the market for light, medium or heavy-duty tasks. 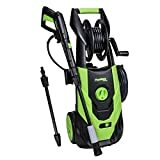 Equipped with an ultra-powerful 14.5Amp/1800Watt motor, this machine delivers a maximum pressure of 2030 PSI for optimal cleaning. For diverse cleaning tasks, users can enjoy the versatility of the two 0.9L detergent tanks that makes it possible to use more than one detergent for one particular task. In order to prevent wastage and prolong the lifespan of Joe’s Pressure Washer, Total Stop System (TSS) is integrated into this hardware piece. Whether you want to maintain your decks, boats, trucks, cars, patios or driveways, the Pressure Joe SPX3000 Washer makes a great option. 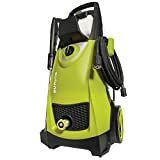 The Sun Joe SPX3001 is another great contender that boasts 5 quick-connect spray tips (0º, 15º, 25º, 40º and soap) suitable for handling various cleaning tasks. 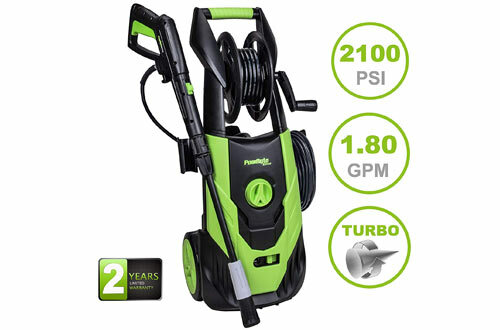 For maximum cleaning power, this beast features a very powerful 14.5amp/1800Watt motor capable of generating 2030PSI. 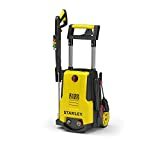 Another impressive aspect of this pressure washer is the 20ft hose for easy access and the onboard reel that keeps the entire unit organized and tidy. Plus, the Total Stop System (TSS) helps prevent damage, reduces energy waste and above all, prolongs the lifespan of this incredible pressure washer. 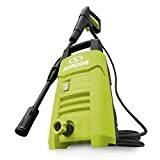 Regardless of the season or time, Sun Joe Electric Pressure Washer makes a great deal for those ready to sacrifice a few bucks for a clean beautifully looking home. 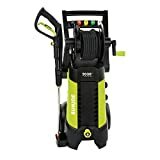 If solid performance and durability are what you are after, then I wouldn’t recommend anything better than KARCHER K5 Premium Pressure Washer. Equipped with a powerful motor capable of performing up to 2000 PSI and 1.4GPM, consider this choice for more demanding cleaning tasks. More impressive is the fact that KARCHER employs a water-cooled induction motor; a crucial factor to durability and maintenance. For top-notch versatility and cleaning convenience, this washer has an integrated 25ft hose plus its reel for effortless cleaning and storage. Moreover, the N-COR pump is non-corrosive and long-lasting. Other prominent features of KARCHER include the Dirtblaster spray wand that shortens your cleaning time by half and the Vario Power Spray Wand that lets you adjust the spray directly from the wand. To sum it up, KATCHER is undoubtedly one of the best top-rated pressure washers you may want to consider. 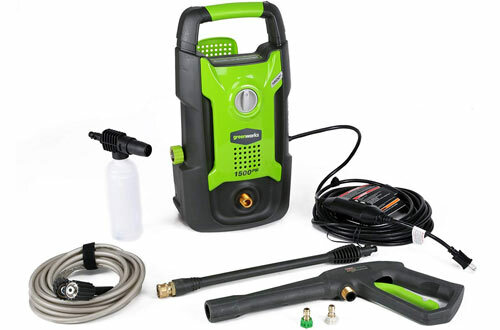 Our top 10 Best list won’t be complete without the Greenworks 1500 PSI Pressure Washer. Integrated with a 35ft power cord makes this washer the ultimate choice for all exterior outlet applications. 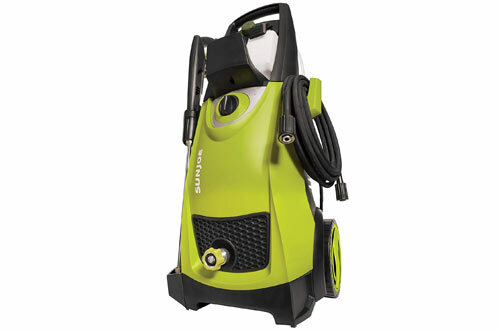 Moreover, it also has a 20ft high pressure that enables you to clean hard-to-reach areas. Equipped with both 25° and 40° quick connect tips, you can effortlessly use this washer in any setting. Most distinctive is the fact that this pressure washer can be used either vertically or horizontal. For maximum cleaning abilities, this unit operates at up to 1500 PSI at 1.2 GPM which is incredible given the price and compact design. 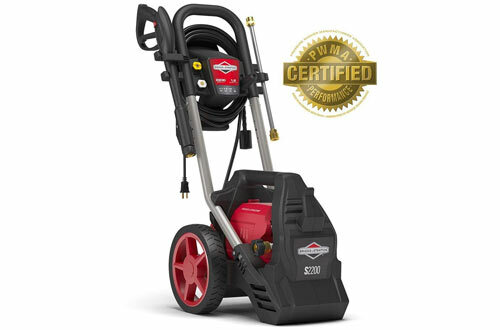 The Briggs & Stratton Electric Pressure Washer is a great alternative to gas-powered washers. When you want to save up to 40% of your cleaning time, Briggs and Stratton is one beast of a cleaner that will blast dirt, grease and debris away owing to its 2200 Maximum PSI. Want a durable motor? One that runs quietly year and year? Well, such potential can only be found in a reliable brushless motor. With three sprays tips (15°, 40° & turbo) you can be sure this machine will handle several cleaning tasks. Another impressive development is the 35ft electrical code and the 25ft high-pressure hose that enables you to easily clean hard-to-reach places. The instant stop/start system saves energy and preserves the washer. If you want to upgrade your cleaning style and save on time and self-effort, Briggs and Stratton are worth trying. Are you tired of struggling to clean your driveway and car with a short extension code? 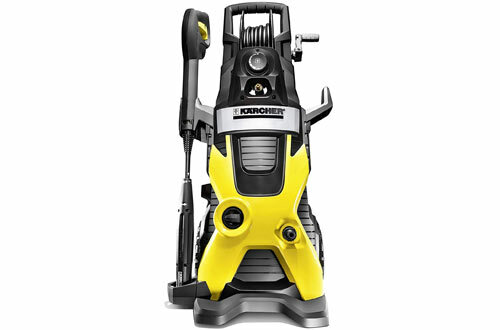 Well, you could say bye to all the mess by grabbing the Karcher K1700 Electric Power Pressure. Operating at 1700PSI/1.2 GPM, this unit will take down any dirt, stains or debris from your driveways in a matter of minutes. For convenience, it has an easy to reach on/off foot switch. To enhance user versatility, this pressure washer comes with three nozzles (15° detergent nozzle, all-purpose nozzle and the turbo nozzle for hard areas) making it a beast that tackles all tasks. Plus, the 20ft high-pressure hose reaches to all your target areas during cleaning. A removable bin is included for convenient storage of small accessories. No tools are required to set up this washer, it is the simplest to assembling, taking about 5 minutes. 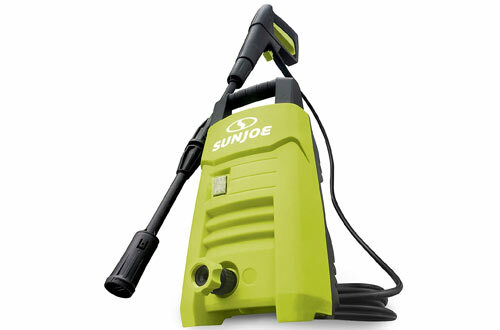 This is another machine from Sun Joe that will enable you to upgrade your cleaning practices. Equipped with a 10amp motor capable of churning 1350 PSI, this machine generates maximum pressure that for optimal cleaning action. No matter the surface, the blasting dynamo of SPX200E won’t let any dirt stand a chance. Apart from boasting CSA Approval, Sun Joe SPX200E has a Total Stop System (TSS) that automatically shut down the machine when it is engaged. The 20ft high-pressure hose makes it easy to manoeuvre to any direction and pinpoint areas that need more attention. Plus, the 35ft. power cord makes it convenient to use this washer in an external setting. 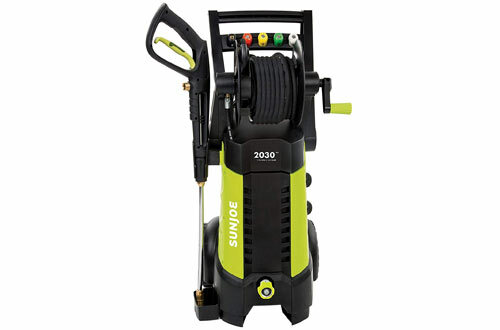 If you are after a durable pressure washer machine that will tackle light to a medium job, Sun Joe SPX200E is worth going for. I would say the PowRyte Elite Pressure Washer is more suitable for heavy-duty jobs. What makes this washer distinct is the adjustable spray nozzle that allows you to spray between 0-40 degrees; a crucial feature in tackling dirt, moss, grim and any other hard-to-remove debris. From a pencil turbojet to a wide fan pattern, you simply twist the nozzle to obtain the maximum cleaning/cutting action. Additionally, it boasts a powerful motor that generates 2100 PSI/1.80GPM at maximum. Just like other advanced models, PowRyte also features the Total Stop System (TSS) that shuts the machine when it is not engaged, a crucial feature that prevents energy wastage and prolongs the life of the pump. 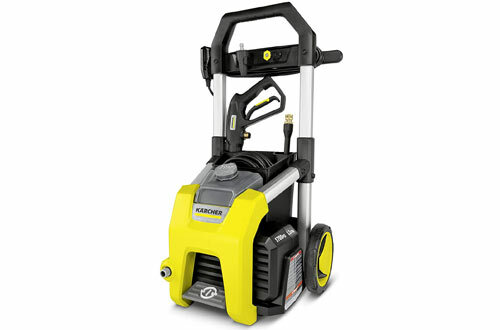 Other robust features of this pressure washer include the 35ft cord with CFCI plus and the high-pressure 20ft hose. If you are after solid performance electric pressure washer, Homdox HX4000 never disappoints. Equipped with an ultra-powerful 1800-Watt motor, this washer will take down any tough grime or dirt. It also boasts an intelligent design with axle mounted wheels for convenience movement. In order to prolong the life of the pump and conserve power, Homdox features an automatic Total Stop System. Washing on exterior outlets is hassle-free owing to the 33ft power cord that is also integrated with the inline GFCI. Depending on how heavy your cleaning task is, you can choose to use the interchangeable nozzles (0º, 15º, 25º, 40º and soap) with much ease. 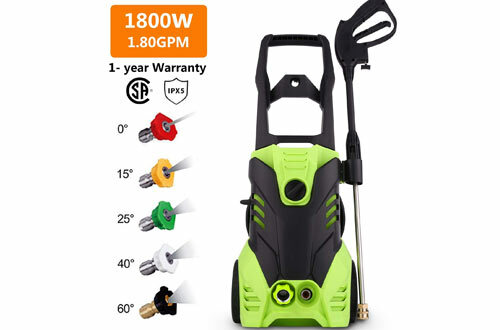 For quick and convenient cleaning of your cars, driveways, patios, garden furniture and much more, you won’t regret owning Homdox Electric Pressure Washer. 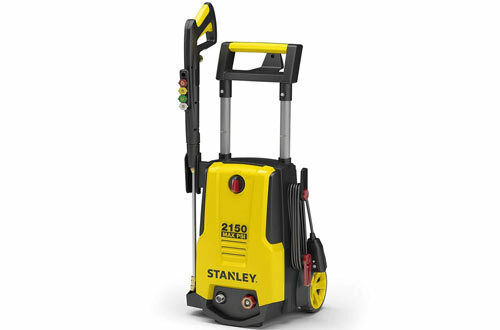 If you want to clean the professional way, you should consider the Stanley SH2150 Pressure Washer. It is another outstanding unit that will transform your cleaning routines. 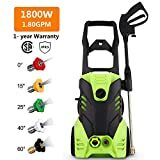 Fitted with a soft flexible hose and 35” power cord, this unit works great when you want to thoroughly clean your driveways, cars, garden furniture, pavements, patios, decks and more. With a quick connect foam cannon, you will the layer of cleaning foam. Plus, the four quick-change pressure nozzle lets you toggle between different spray patterns for a versatile cleaning experience. One aspect that sets this pressure washer apart is its power, it churns out 43 times the pressure of a regular 7GPM garden hose. Not to forget, this machine comes with a free O-ring replacement kit.